"In Wakanda everybody had guns!" All across America (and even here in Canada), people are rallying in support of stricter gun control laws as part of the March for Our Lives. 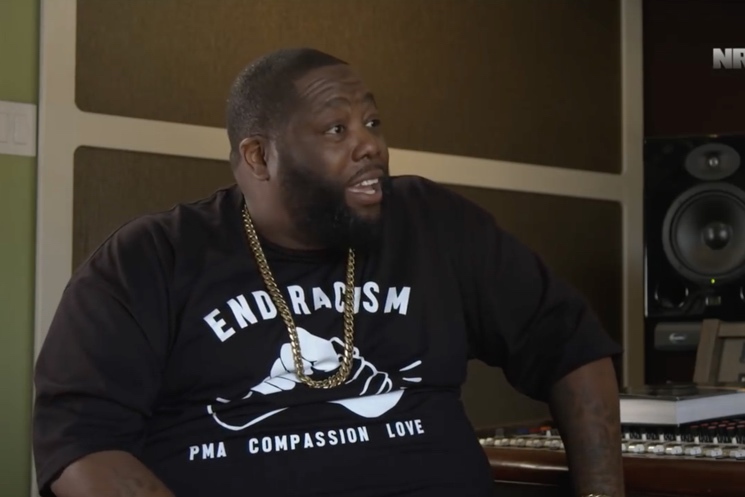 On the other side of the spectrum, however, Run the Jewels rapper Killer Mike has voiced his pro-gun views in a video for NRATV. The episode is called "The March for Less Freedom." It features Mike speaking with gun activist Colion Noir about supporting the Second Amendment and why he disagrees with the March for Our Lives. Mike says that he belongs to a "gun-owning family," and he evidently is fairly hard-line about his views. At one point he says, "I told my kids on the school walkout, 'I love you — if you walk out that school, walk out of my house.'" His arguments largely focus on the need for people to be able to defend themselves. He also makes an unexpected Black Panther reference by saying, "In Wakanda everybody had guns!" He doesn't particularly engage with the other side of the debate, as he dismisses anti-gun protestors as being "[lackies] of the progressive movement." Mike is a rather surprising ally for the NRA, given that he has previously fallen on the left side of the political spectrum — he was a staunch Bernie Sanders supporter and has spoken out against the use of Confederate symbols in public spaces. Throughout the interview, he speaks about sometimes disagreeing with his allies and not falling into line with political ideology. UPDATE (3/26, 10 a.m. EDT): Killer Mike has since taken to Twitter to clarify his position on gun ownership, and has apologized for the way in which the video was used in contrast to the March for Our Lives protesters. "I did an interview about black gun ownership in this era. That interview was used a week later by NRATV to disparage a very noble campaign that I actually support," he said. "I'm sorry that an interview I did about a minority — black people in this country — and gun rights was used as a weapon against you guys. That was unfair to you and it was wrong, and it disparaged some very noble work you're doing." He added, "It should never have been used in contrast to your march, and I think it's wrong. To the young people who worked tirelessly to organize, I'm sorry adults chose to do this. I'm sorry NRATV did that." If you feel like hearing Mike's views on gun ownership, you can watch the video below.